I've never really had the patience for thrift or discount stores. I am not one of those people who gets a thrill from digging through disorganized racks, but I will do it when I'm in the mood once or twice a year. I prefer antique malls in general (more on this soon), but these days it's really hard to find old furniture that is not a) really valuable, or b) already "shabby chic'd" to hell. So I have found myself in Goodwill a few times lately, skimming housewares for various different projects I have in mind. Turns out, there is a lot of new stuff at Goodwill! Since I usually donate about three carloads of stuff to Goodwill every year (multifamily yard sale leftovers and cleaning out closets), it has suddenly occurred to me that it's like I trade in my old stuff to make room for new, better stuff! Now I am addicted. 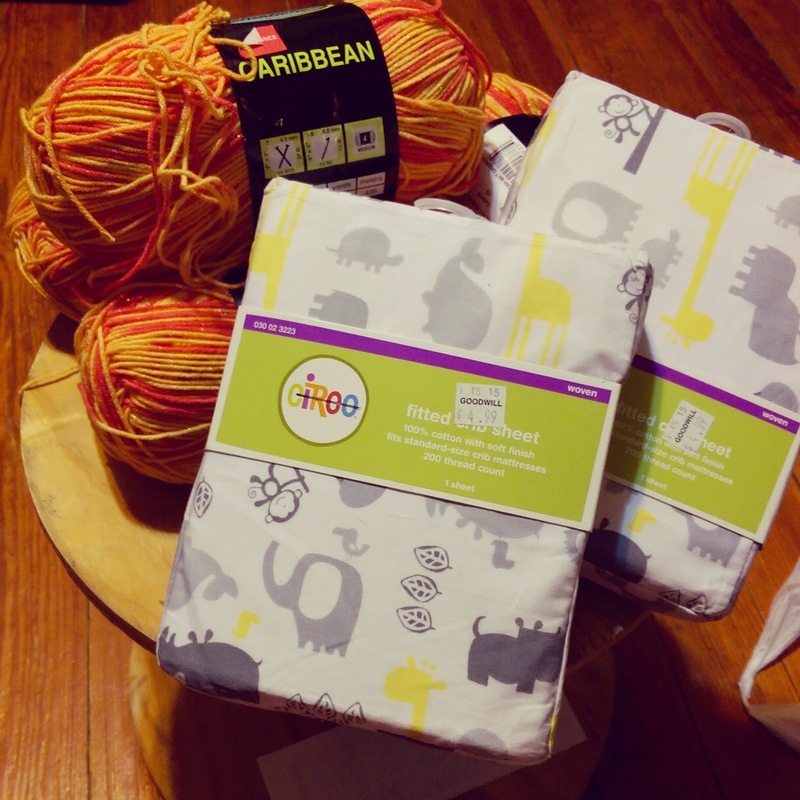 Here's today's haul: two new Circo crib sheets and four skeins of yellow and orange sparkly yarn for $13 and some change. Goodwill is a GOLD MINE for new baby stuff from Target! Also, did you know that Goodwill has an online auction site for the really good stuff?